This is WizKid & Skales first time to Canada. The press conference though slated for 7.00 p.m. did not start until 9:15 p.m. but it was well worth the wait! Clad in a red T-shirt [with a small animal print patch pocket] and a pair of blue jeans; Wizkid looked both casual and CHIC. His signature shades, no surprise, stayed on all night. He confessed that he’d been looking forward to touring Toronto and made sure to thank his fans for his continued success. Ayodeji Ibrahim Balogun a.k.a Wizkid, is an incredibly talented artist from Nigeria. Since the release of his debut album Superstar last year, the 23 year old has won a MOBO award, BET award [Best International Act, 2012] and signed with AKON’s Konvict Music! He is also the official brand ambassador to Pepsi in Africa, as well as Nigerian Breweries along side Tuface and D’Banj. Shakara Natural Tips: What was the first album you ever bought? “Superstar.” WizKid replied. Maybe he thought I asked: What was the name of the first album you ever dropped. In any case, we think he has the complete package…youth, voice, looks, and HAIR! and depicts these effortlessly. Aug 18 – Atlanta (Banky W/Wizkid/Skales/Rotimi/XO) presented by EME, Konvict, Mr DeJaVu. Skales & Shakara & Wizkid, posing with Himba bracelets courtesy of Nharo! 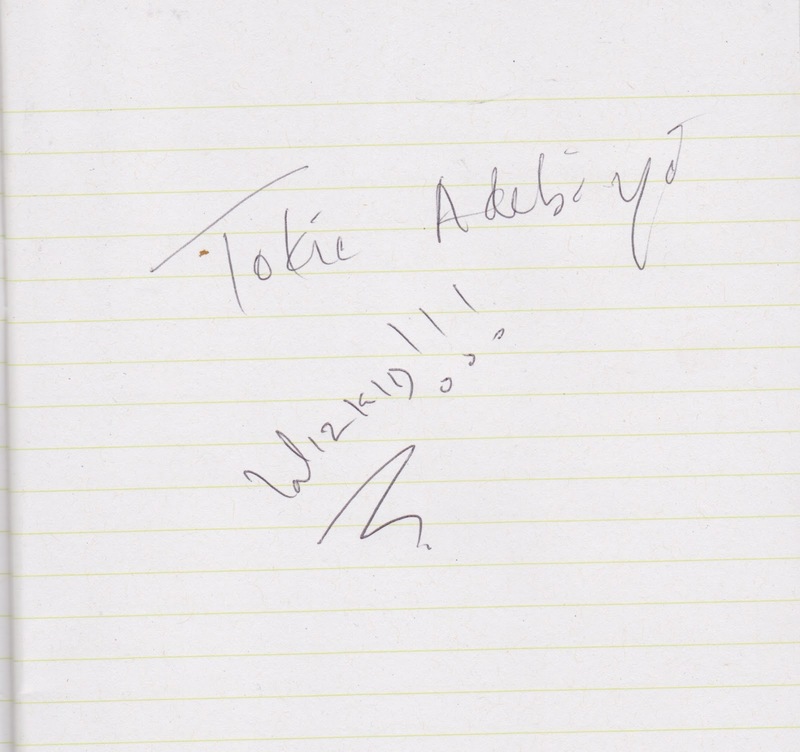 Check out the autograph Wizkid signed for my cousin Tokie Adebiyi! LOL You are too much Tokie! enjoy!!! She is too much…But I like her dreams, it means nothing is toooooo much to aim for, Right? Oh this looked like so much fun. I check them out – wow – I really hope they make it in the US – it would be nice to hear them on the radio! BTW – you looked GREAT – the hair – the dress!! Gorgeous! Thanks so much Daphne! much appreciated!! yes it would be great to hear them on radio, wishing them much success. Elif Aslan on What is BLACK SOAP?